The westernmost section of northwest Florida is considered the gateway to Florida. Here at Outdoor Gulf Coast, we consider it the gateway to all Florida adventures. Beginning in this area of Pensacola there are many hiking adventures awaiting you. It’s in northwest Florida we have the beginning of the Florida trail system. In addition to the trail system, there are many areas to hike and explore. We hope you will discover new places to hike as we continue to expand our list, with Pensacola being the starting point for your hiking adventures. If you would like to contribute more places to the hiking areas we have listed, please let us know. Trail Guide Map – click the icons in the map for hiking areas. Jones Swamp Wetland Preserve and Nature Trail is part of the Bayou Chico restoration project. The preserve includes 1,300 acres within the Jones Creek Watershed. It was created to provide protection for Pensacola Bay. 3 miles of paved walking/biking paths along Bayou Grande. 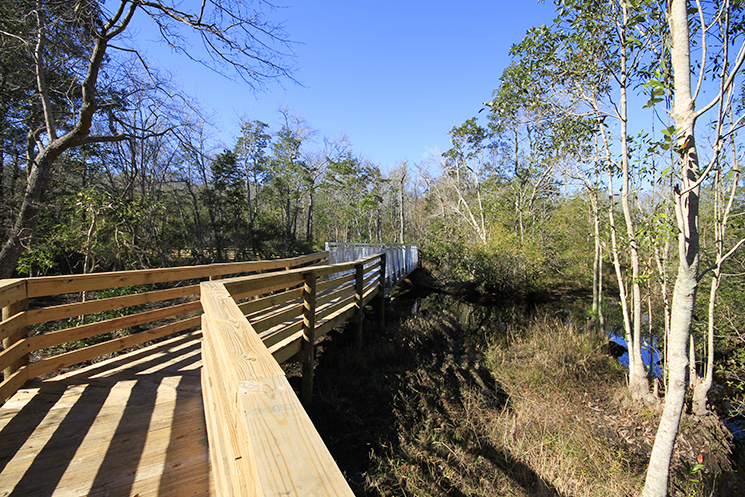 Raised boardwalk through the wetlands in West Pensacola. This boardwalk is at the Water Reclamation facility. Nice place for walking and birding. Beautiful paved/boardwalk that winds through wetlands down to the bayou. There is a small pier on the bayou to enjoy the surroundings. In addition to the paved trail, there are many off-grade trails to hike. 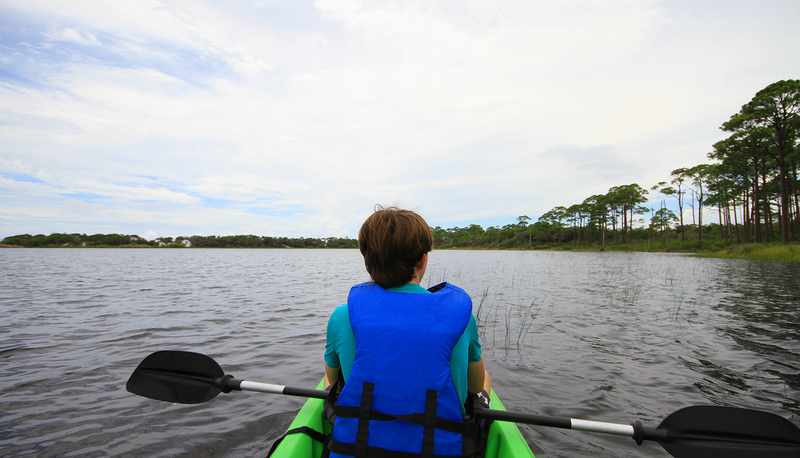 Located on the Perdido River Fillingim Landing offers paddlers and hikers a nice setting for exploring the outdoors. Fillingim Landing includes a kayak/canoe launch, hiking trails, picnic table, BBQ grills, and bathrooms. Bay Bluffs Park is maintained by the city of Pensacola. The park is a 32-acre park along Escambia Bay located off Scenic Highway near Summit Blvd. The park has many boardwalks leading through the oak and pine forest along the bay. UWF includes over 20 miles of hiking and biking trails. A section of trails includes the Edward Ball Nature Preserve Trail. This boardwalk is an enjoyable half-mile hike through Thompson’s Bayou. Visitors will enjoy viewing many birds, fish, and reptiles. Good access point for the trails for hiking or mountain biking. This trailhead connects you to the red and green trail system. There are many trails to explore in Fort Pickens. Hikers will enjoy much wildlife. Parking at Battery Worth will give you access to many of the trails. The Perdido Key Discovery Trail is located in Johnson Beach. This park is part of the Gulf Islands National Seashore. The boardwalk provides a unique setting to discover the natural beauty of the seashore. This is an easy walk and a great place for bird watching. Bayou Marcus Nature Trail is located near Perdido Bay Country Club. The boardwalk gets takes you out over the wetlands. Big Lagoon State Park is a beautiful place for hiking, camping, bird watching, or having a fun family picnic. There are many trails to explore throughout the park. The trails range from boardwalks to sandy trails. Shoreline park has both walking paths and hiking trails. This is a beautiful park to explore. Terrain: Concrete walking paths & sandy trails | Park amenities: restrooms, picnic areas, playground, fishing pier, boat launch, dog park, pavilion. The Gulf Islands National Seashore-Naval Live Oaks Park located in Gulf Breeze is the perfect place to enjoy some quiet time of hiking, picnicking, or relaxing by the water. 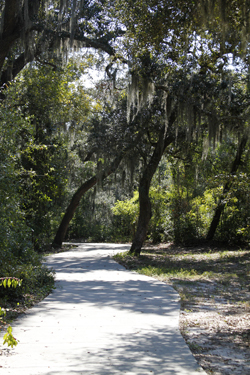 The Naval Live Oaks park is located in Gulf Breeze and has over 7.5 miles of hiking trails to enjoy. Brackenridge Nature Trail is a 0.3-mile boardwalk loop trail located in the Naval Live Oaks Park, a part of the Gulf Islands National Seashore. The Wiregrass Trail is located in Blackwater River State Forest and is part of the Florida National Scenic Trail. On this trail, hikers will enjoy some of the largest remaining longleaf pine/wiregrass found anywhere. The trail is 12.7 miles in length. Access this trail North of Hurricane Lake Recreation Area. For details, visit here. The Sweeterwater trail is located in Blackwater River State Forest. The trailhead is located at Krul Lake State Recreation Area. The first section of trail is handicapped accessible with a boardwalk. The trail includes a suspension bridge and a gristmill on the boardwalk. The trail is 1.3 miles and connects to Bear Lake. Get a bit of history as you retrace one of the earliest trade routes of the Indians and settlers in Florida. This trail is a 21.5-mile hike and is certified as a segment of the Florida National Scenic Trail. For directions, maps, and other information click here. Enjoy hiking along Juniper Creek. The trail is an unpaved trail that runs 8.8 miles. Juniper Creek Trails is certified as a segment of the Florida National Scenic Trail. The southern end of the trails joins up with Blackwater River. It’s time to go camping . . . or fishing or hiking! You can do all this and more at Karick Lake. Located in the Blackwater River State Forest, just 7.5 miles north of Baker tucked away in our little neck of the woods is this spectacular 65-acre spot. The park includes a 3.8-mile hiking trail around the lake. Blackwater River State Park has access to many hiking trails including Chain of Lakes Hiking Trail and Jackson Trail. Ponce de Leon is a beautiful State Park located in Northwest Florida that’s perfect for a day trip. In the park, there are two hiking trails where hikers will enjoy a lush hardwood forest. The park also includes Includes a beautiful spring for swimming for those hot summer days. Garcon Point Trail has a 1.7-mile loop and a 1.2-mile spur off that trail. We hiked the 1.2-mile spur then walked back another 1.5 along Garcon Point Road. Enjoy history and the great outdoors as you visit Arcadia Mill. This site once included a water-powered sawmill, lumber mill, textile mill, and more. There is a handicap boardwalk and off-road hiking trails at this location. 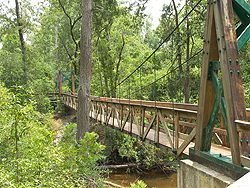 The off-road section of trail includes a suspension bridge over Mill Pond Creek. Weeks Bay includes two boardwalks. There you will enjoy viewing the natural surroundings around Weeks Bay and Fish River. The Hugh S. Branyon Backcountry Trail includes over 15 miles of trails in Orange Beach and Gulf Shores, Alabama. These trails are perfect for hiking, biking, or jogging. Nice collection of local hiking trails. My favorite trail is the Juniper Creek Trail. There is a shelter about 5 miles from the south trailhead. A fun trip is to night hike in from the south, camp and head back out the next day. Hey Beau, Thanks for the comment. I bet that would be a good camping/hiking trip do to.